Review: Another triumph for Jill Mansell! I have just finished her new book, and can't believe what a delightful mix of emotions there is within its pages. I found myself laughing one minute, apprehensive as to what was going to happen the next, and then crying tears of sorrow or joy. It was easy to read; from the very beginning, I was absolutely captivated. When the heroine of the tale, Essie, writes a letter intended as a joke for her friend, Scarlet, and it somehow ends up being sent by email to all in her address book, it seems like her perfect life as she knows it is going to come to an end. However, but for that she would never have met the incredible Zillah, housemate Conor or ended up working for the lovely Lucas. These are just some of the events that happen due to sheer coincidence throughout the book. The action takes place mainly in Bath and its surroundings. Lucas owns a pub there, which sounds a really warm and friendly place to pop in for a drink. I loved all of the characters that Jill has brought into this story, except for Essie's boyfriend and his mother, both of whom are anything but likeable. The star for me was Zillah, an eighty-something year old with such a young spirit and a heart of gold. I would love to think that I could be as adventurous at her age. The story begins with a scene involving her, and you can tell straight away that she is going to be quite a character. Then there were the two principal males in the story, Conor and Lucas. What great men, both of them obviously incredibly handsome, and apparently well able to cope with whatever is thrown at them. As well as being populated with varied and interesting characters, the storyline has been really cleverly written to weave in all of the chance meetings that go together to suggest that there is such a thing as fate for the main and also minor players. 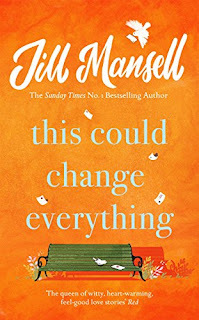 I would recommend this wonderfully heartwarming story to absolutely anyone, whether or not they have previously read anything by Jill Mansell. Once started, it holds the attention right up to the last page.